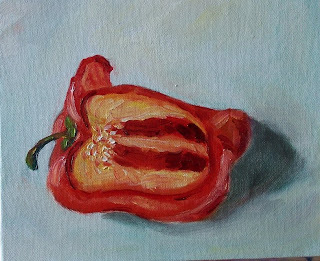 This little 5 x 7 oil on canvas panel is a tribute to my lovely sister-in-law, Colleen. She couldn't be with us at Christmas dinner this year, but she sent cookies--a giant platter of them. These are just three on a red envelope. Thank you, Colleen--we missed you, but enjoyed your cookies. I played with triads today. 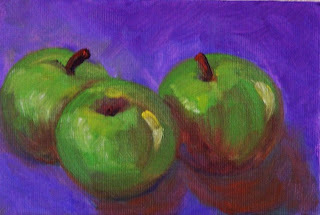 Three Granny Smith apples--three colors--green, orange, violet in a fun little 4 x 6 format. 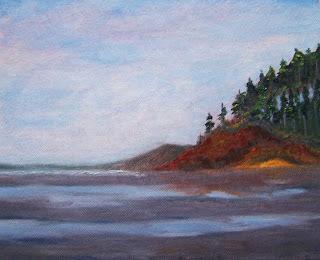 Oil on canvas panel. 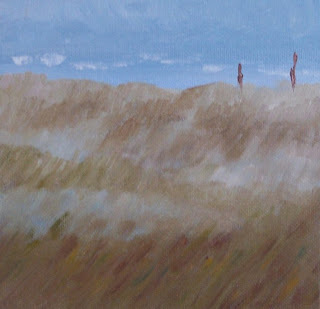 Here's a painting of beach grass at the Washington Coast. In December it is wet, wild, and windy. I'm hoping for a good storm. 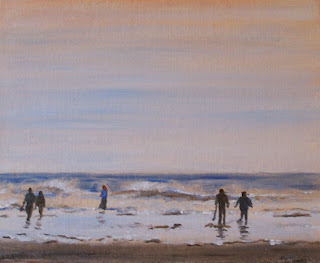 I enjoy walking the tide line after the wind has blown surprises up on the shore. 6 x 6 oil on canvas panel. 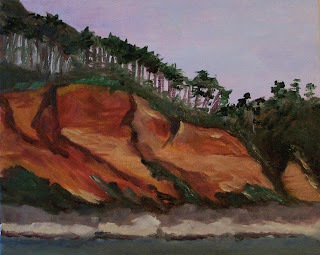 This painting is based on a photo I took a few weeks ago just North of Copalis Beach on the Washington coast. 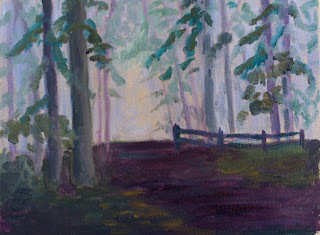 I painted it early this morning while we still had power. Hope you enjoy. Thanks for looking. 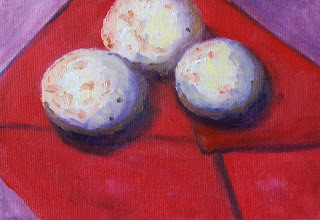 Approx 6 x 6 oil on gessoed hardboard. 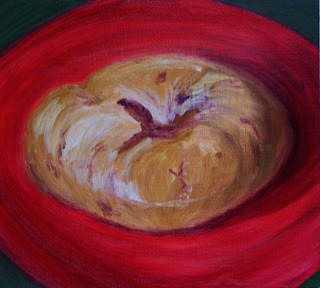 This is a blueberry bagel I painted in the half-light. Lost our power today, so I couldn't do much else but paint. Lights came on just a few minutes ago. 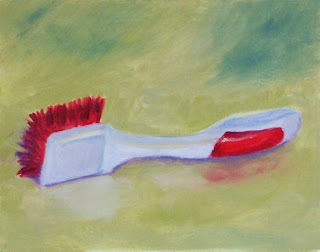 I've been spending too much time brushing up lately. 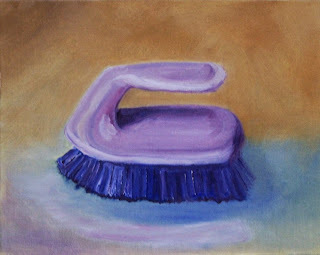 8 x 10 oil on canvas covered hardboard. 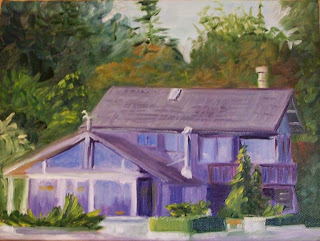 With the holidays and guests coming soon, I have to put down my paintbrush and pick up this one. I'll be back as soon as the house is clean. Happy Holidays! 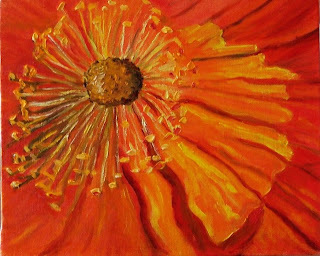 I am getting tired of wet, gray, drizzle, so I painted this little reminder of summer sunshine. I hope it cheers your day like it did mine. Last weekend was a clam digging weekend at the coast in Washington State. 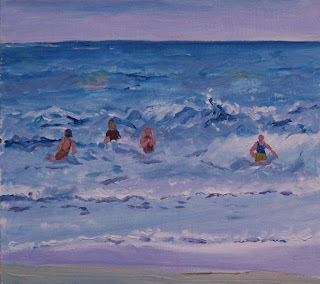 This painting is inspired by a beautiful evening sunset in which those hearty people practiced their sport. You've gotta be tough to dig clams in December! 8 x 8 oil on masonite. In December don't we wish we were there.